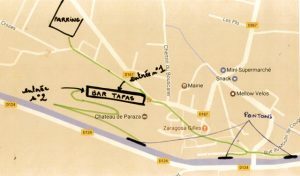 THE TAPAS BAR OF THE CHATEAU DE PARAZA IS A PEACEFUL HEAVEN FOR A GOURMET BREAK. ON THE TERRACE OR IN THE FRESHNESS OF THE CELLAR, YOU CAN TASTE THE LOCAL SPECIALTIES. ONLY PRODUCTS FINELY SELECTED FOR THEIR DELICACY AND CHARACTER, OR DIRECTLY COMING FROM OUR ORGANIC VEGETABLE GARDEN. TO PAIR WITH A GLASS OF LANGUEDOC WINE. If you want to organize a lunch / dinner with a group of friends, we can prepare a special menu upon reservation. A parking is available next to the tennis / boulodrome, at the heart of the village of Paraza. Access to the winery is done by the Chemin du Parc: the entrance is 30m further on the right. Direct dock by the terraces of Château de Paraza, located between Paraza and Roubia: access is then done by walking along a steep track up to the winery. Docks are available in the harbor of Paraza, before or after the small red bridge: access is done by walking through the town for 300m. The entrance of the winery is located 50m on the left after the big red gate of the cellar. From June 1st to October 1st, open every day from 10am to 8pm.